"Each week we prayed a rosary together and as our devotion to the Blessed Mother grew our hearts became filled with peace and we felt a closer connection to our Lord. We began to fully appreciate and understand the phrase 'To Jesus through Mary'. With increased endurance and enriched faith we completed the Columbus Half Marathon and called ourselves 'Mamas Movin’ With Mary'. It is now our goal to inspire others to take time for themselves and 'Get Movin’ With Mary'." 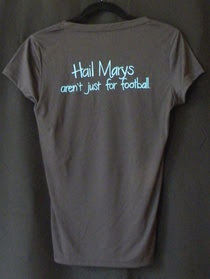 The shirts can be ordered here at the Mama's Movin With Mary website.